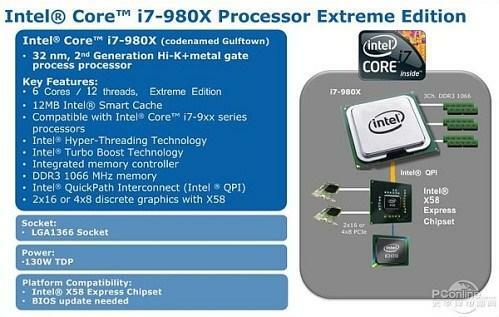 Intel's new Core i7-980X and Core i7-970 six-core desktop processors are set to debut in March, but could see an early release on Apple's Mac Pro systems in a matter of weeks, according to a new report. Citing multiple sources, Hardmac reported Tuesday that the partnership between Intel and Apple might allow for the new six-core processors to debut in Mac Pro desktop machines earlier than other hardware. If true, it wouldn't be unprecedented —the last two revisions of the Mac Pro line had the first crack at their respective chips. "So, if Apple and Intel are still engaged in a tight partnership, Apple might have the exclusivity of such CPU (as for the Nehalem Xeon) for a couple of days or weeks," the report said. "So, if you are waiting for [a] new Mac Pro to change your current model or purchase your first Mac Pro, then get ready after the second-half of February, it should come within the next three weeks." The report also speculates the new hardware will be based on Mac-edition Radeon HD 5870 graphics cards. Reports of a Core i7-980X-based Mac Pro have lingered for months. The "Gulftown" architecture, 32nm processor has a clock speed of 3.33GHz and is expected to arrive on the open market in March. The chip is the first dual-docket, six-core processor from Intel. The new 32 nanometer chips have 12MB of L3 cache, and six cores with 12 threads for each CPU. Apple usually doubles the processors in its high-end professional workstations, so it's possible the new Mac Pro system could have a total of 12 cores and 24 threads. The new hardware could be released sometime in the first quarter of 2010. The last major refresh to the Mac Pro equipped it with its Nehalem Xeon processors, with a high-end eight-core Mac Pro offering two 2.26GHz Quad-Core Intel Xeon 5500 chips. Earlier this month, Apple quietly upgraded that to a potential maximum 2.93GHz eight-core system.